A San Diego man was left furious after police wrongly identified him as a person of interest in a neighborhood burglary last month. 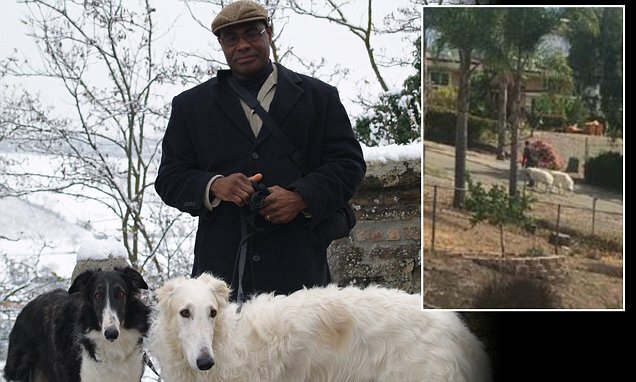 Ike Iloputaife had taken his three-year-old Borzoi dogs, Lars and Luvkiy, for an early morning walk around Vista, where he lives, on May 16 - just seven hours before a home he'd walked past had been burgled, the LA Times reported. Police issued a press release with pictures of the three suspects, and a 'person of interest'. Iloputaife, 55, was stunned to see a picture of him on the release, listed as the 'person of interest'. The suspects were all black males, and Iloputaife is also black. He was listed in the release as appearing 'similar to Suspect 2 in the burglary', even though Suspect two was described as being between 20 and 35, at least six feet tall and weighing 260 pounds. Iloputaife said he had been vacationing in Yosemite when the picture was released days after the incident, and came back to hear the news from a neighbor.